Dragon finds himself mysteriously transported twenty five years into the future, in the dangerous city of San Futuro. He stands over the recently murdered freak, Mako, who has had the number “10” imprinted on his chest. Gangreen arrive on the scene and assault the policeman as the victim recently became a friend of theirs. The battle is ended by the arrival of Marshal Law, who recognized his old enemies as well as the uniform, even if it is outdated, of a police officer. He aids the superhuman fend off the attack and briefs his new ally on a series of recent homicides carried out on members of the superpowered community. It seems a vigilante is targeting superheroes who have broken any one of the Ten Commandments, being dubbed the Commandment Killer. The time-displaced police officer is taken to the San Futuro police station where his new ally informs him of the two previous deaths, Breathless and the new Star. 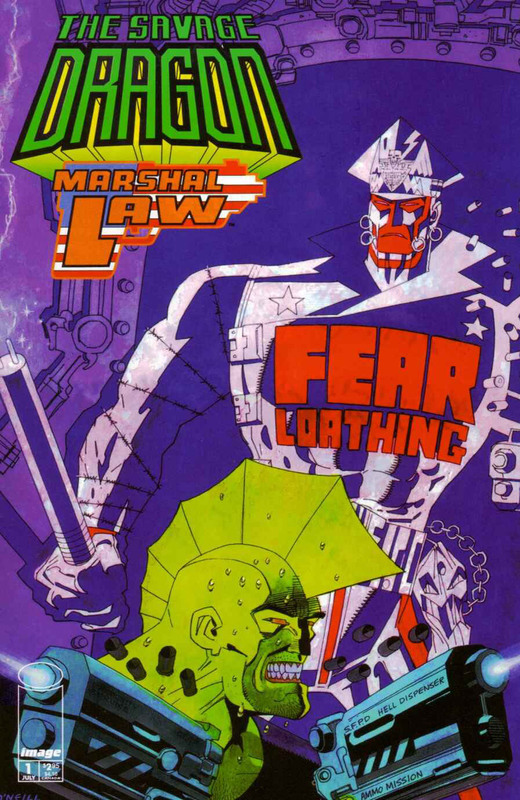 Marshal Law takes the intrigued freak to his day job at a hospital ward where he takes care of mentally-ill superhumans. While in this building, Dragon is reunited with the future incarnation of the human host of Mighty Man. She states that she moved to this city to flee Mako, who was trying to blackmail her into handing over her powers to him. Ann Stevens has also given up her alter ego as it was becoming as revered as Public Spirit, the deceased and disgraced former national hero, which she disliked. This story takes place in the late 21st Century. It has been speculated that Dragon’s unexplained appearance and disappearance in this mini-series might coincide with the “time-bomb” that was attached to him in several issues of Big Bang. The bomb sent Dragon through time randomly and without warning. However, the bomb is clearly not visible on any of the pages in this book and is never mentioned.